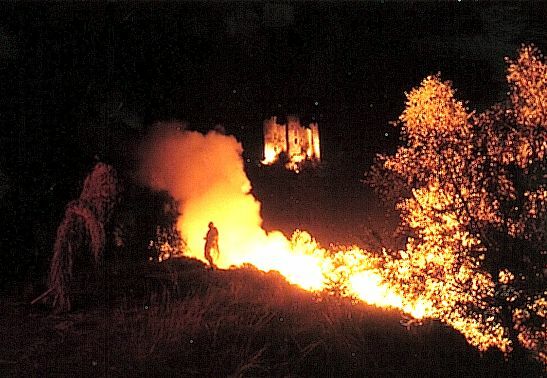 Every two years, at the beginning of August, there was a show at Alleuze. 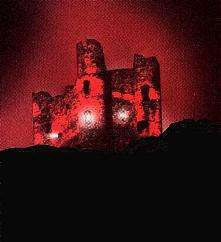 Its purpose wass to show the old Medieval castle to advantage; at the beginning, the story was based on a remarkable episode of the history, the castle seized by the chief of a band fighting for the English Crown, Bernard de Garlan. But within this story, there was also the life of the countrymen, at the beginning of the XXth century. 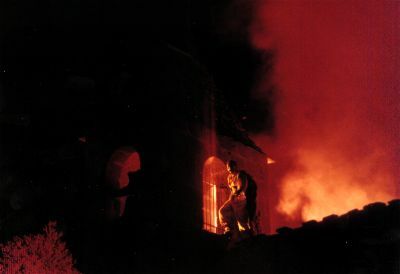 The show ended with the illumination of the castle, remembrance of the time when it was destroyed by the city of Saint-Flour. 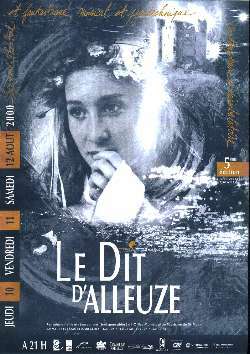 The poster for the Tale of Alleuze 1998. The poster for the Tale of Alleuze 2000. 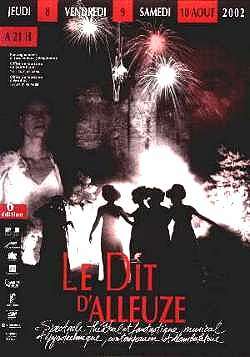 The poster for the Tale of Alleuze 2002. So, until 2002, the tale was based upon the Garlan's story. Historically, the captain called Bernard de Garlan existed, at the very end of the XIVth century. During the fights between England and France, he seized the Castle (see page the Castle of Alleuze: The great Times of Alleuze). But in this country, the legend made him a hunch-backed and evil spirit, who ate children. Garlan, between earth and hell. Photograph by J.-F. Ferraton, Saint-Flour. 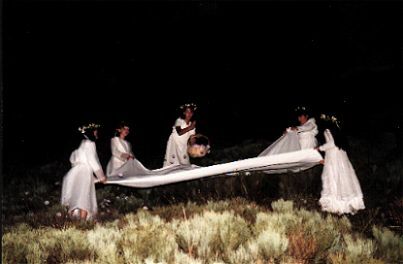 On the other hand, in Alleuze, the grand-mothers told the children a lot of stories about fadettes, small fairies in the occitan dialect. Everywhere, on the heath and on the hills, during the night, supernatural spirits were wandering... The narrations were in occitan dialect, which still is spoken by old people. Fairies on the heath?... The Tale, 1998 edition. Photograph by Pierre Soissons. 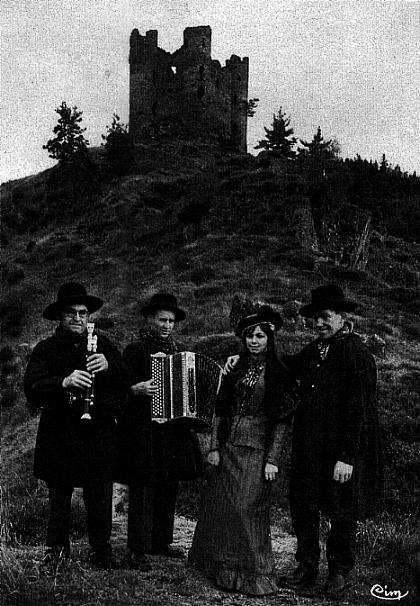 At last, at the beginning of the XXth century, the Blancon brothers, from La Barge, were well-known musician, one as a cabretaïre (playing a local sort of bagpipes), the other as an accordionist. The authors of the show dreamt about their life; then the Girouflet brothers were born, who are the heart of the Tale. They were called Adrien and Bébert Blancon. Their father was a peasant and café owner, in the small village of La Barge. took part in all the feasts in the country. is (very, very freely...) drawn from that of the Blancon brothers. These are the foundations on which the show rested. 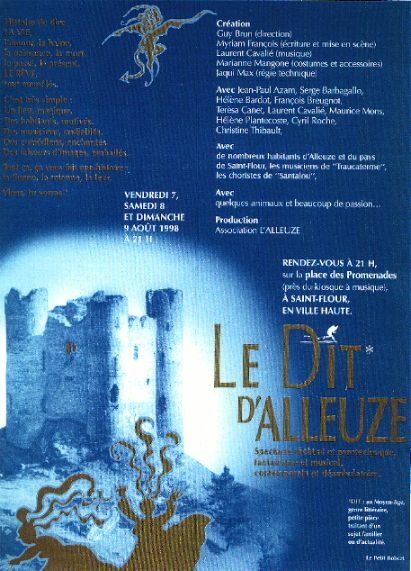 The show took the old name of Dit, which in old French designated the legendary tale. Some other legends are wandering on the moor. For example, the legend of the Golden Barrels is still whispered: some lost tunnels are supposed to have been a secrete exit of the castle; and the Treasure of Garlan could have remained hidden there. Garlan. The Talet, 1998. Photograph by J.-F. Ferraton, Saint-Flour. Apparition of Garlan. Photograph by Pierre Soissons. 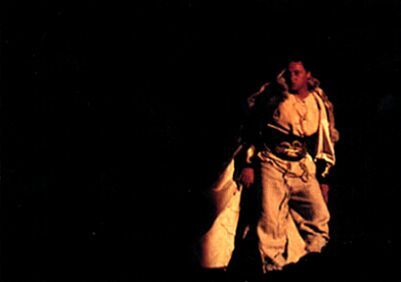 The show was given for the first time on the 6th and 8th of August, 1993. The second edition was on the 5th, 7th and 8th of August, 1994. Then, the others followed every two years: the third edition dates from the 9th, 10th and 11th of August, 1996, the fourth from the 7th, 8th and 9th of August, 1998, the fifth from the 10th, 11th and 13th of August, 2000, the sixth from the 8th, 9th and 10th of August, 2002. 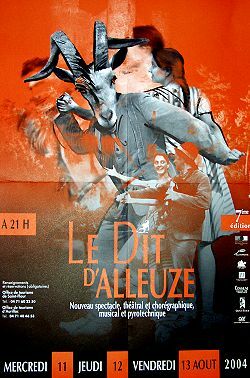 Poster of the Tale of Alleuze 2004. The show was organised under the aegis of the l'Alleuze Society, managed by Jean-Claude Guy and co-ordinating the show, on the request of the Municipality and in a strong collaboration with it. The inhabitants were participating in different ways, for organising and for crowd parts. The Municipality of Alleuze gave its technical and financial assistance. From the beginning and until 2004, Guy Brun has brought his help and his decisive enthusiasm. The next pages will show the different castings of the artistic team. The City of Saint-Flour, first, then (after its creation) the District (la Communauté des Communes du Pays de Saint-Flour) brought their help, with financial support, but also with a strong technical support (in the organisation, in the communication, etc.). The Departmental Council of the Cantal and the Regional Council also brought a financial contribution. At last, some private sponsors brought their help. From the thunderbolt and from the tempest, deliver us, oh Lord. From the sudden death, deliver us, oh Lord. God, we praise thee, God, we praise thee. Inscription graven on the bell of the Saint-Illide Chapel, 1558.